Here is a project that I've been working on for the GBS scaler boards. I'm not well versed in posting these kinds of things, so this could be a bit confusing for the moment. I'm also new to the forums but have been reading a lot of information on here and getting into CRT retro gamming as I mentioned in the introduction thread. 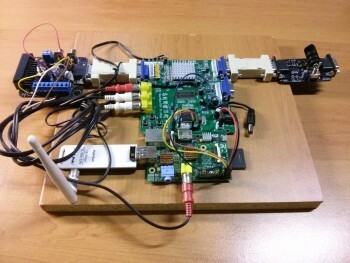 I have created some code for a Raspberry Pi running Rasbian to interface with any GBS board (8200 or 8220). 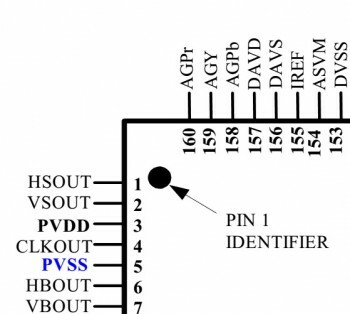 This programs the register settings in the scaling chip, the TVIA Trueview 5725, directly via I2C at 3.3V. 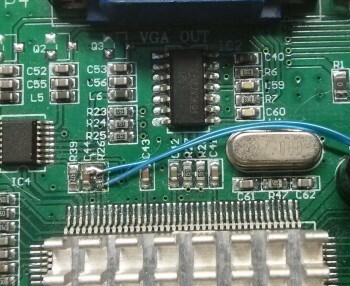 The on board MTV230GMV microcontroller, sometimes going by rebadged labels such as GBS800MV, is bypassed by shorting the jumper on Port 8 (P8). This puts it into In System Programming (ISP) mode, which means it can't interfere with the custom settings being programmed. I have created some python and bash scripts that allow for a black and white interactive menu from the Raspberry Pi's composite acting as pure Luma. This has allowed me to create, save and recall settings for 240p and 480i RGB to 480p YPbPr, as well as 288p and 576i RGB to 576p YPbPr. I am in the process of documenting my code for posting on GitHub. In the meantime I'll post more information to see what interest others have in this work. Probably the last version I will make. This adds colour correction, dynamic de-interlace, extra video modes and component sync level adjustment. An updated version is now avaliable with 1080p 60Hz RGBHV and YPbPr modes added. All YPbPr modes should now use a correct sync level. See the change log below or on github for a small summary. I have finally put together a package that can be easily installed on a fresh install of Raspbian on a Raspberry Pi. This is to allow others to try out the settings I have made if they want. I'm not sure if I will be able to update this at all, I'm now going to concentrate on reading and writing to the GBS micro. I'm sure the quality of the code is very poor seeing as this is my first time doing this sort of thing. I've added code to detect rev1 Model B boards. This should allow for direct installation on these boards, but I haven't testing this myself. I was trying to make sure the scripts would work with any version of the raspberry pi, but I have given up on that for now. This means you will need a rev2 Model B or any other raspberry pi. I believe only the very early rev1 Model B use the old i2c port, most should use the new port. Also, the user needs to be the default "pi" as I have assumed the home directory is "/home/pi". Spelling in Menu fixed "Rasberry" -> "Raspberry"
As you may know RGB signals are normally 0.7v pk-pk. A component luma signal (or SOG) have an added 0.3v sync level underneath, making the signal 1.0v pk-pk total. The GBS board has a resistor that sets the maximum output range of the video DAC. This is set to create 0.7v pk-pk signals only, which explains the issues with component thus far. Version 0.3 of gbs-control has a sync level setting to adjust this to attempt to get the best compromise between sync stablility and brightness levels for a standard GBS board set for a 0.7v signal. A value of 194 should achieve 0.3v sync levels, but with reduced video range. Where Vout is the max voltage level before double termination, that is 0.7v * 2 to get 1.4v. Rout equals the output resistance, 75 ohms. And Riref is the setting resistor, normally 150 ohms on the PCB. This give a value 0f 1.48v pk-pk max for the normal GBS boards, which is slightly above the expected 1.4v pk-pk. If the total series value of the Riref resistance can be changed to around 111 ohms, then the output voltage would be 2.0v pk-pk, or 1.0v pk-pk when terminated. I have fitted a switch to one of my boards with a 430 ohm (100 + 330) resistance that can be switch in parallel with the PCB 150 ohm resistor. This gives the option of 150 ohm for 0.7v signals, or 111 ohm for 1.0v signals. So those that want better component output can try this. Use the default sync level of 146 in the menu for 0.3v sync with this mod. The Iref resistor is shown below, it is connected to the sixth pin along, and then to ground. The original firmware had many issues for use with low res gamming content, particularly for us PAL 50Hz users. I have seen and read about lots of these issues before I started work on my custom settings. The most obvious is the deinterlacing applied to progressive 15Khz sources. I have been able to get around this issue with an odd glitch. I have not been able to get 240p input working without using the deinterlacer, but It can be tricked into doing an exact line doubling. And by disabling the vertical scaling engine and setting the output resolution to exactly double the input the results are very sharp. The most frustrating for myself, was the 50Hz performance. I knew this board was hit and miss with 50Hz, but fagins YouTube video review of the SLG-In-A-Box shows that the unit can work with a 50Hz Megadrive. But that's when my trouble started. I bought a GBS board locally from a PC & Arcade shop. The first board I bought worked with 50Hz input, but had insane amounts of noise in the image. 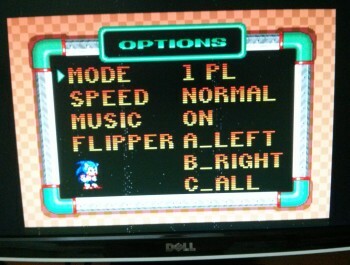 Here are some images from that board with Sonic spinball on the Megadrive. A shift in the image occurs due to the placement of the low res content in the total frame in PAL vs NTSC timings. Here is a Google drive folder with PDF datasheets for some of the chips on the GBS boards, as well as a link to a web view of a leaked 5725 programming guide. It is this guide that has allowed me to do anything with the board at all. However, it isn't complete and some settings I gleamed from a what appears to be a clone chip. To complete something that can be flashed to the GBS board would be the end goal of this work. That is something that is going to take a fair while to accomplish. I've been in contact with bencao74 about this as I thought he would be interested in it, as he sells these. So I now ask you guys to respond and let me know if this project is worthwhile continuing. It started out as a small project for fun, but If others can help port the settings over to the on board controller, then this board could become a proper entry level gamming scaler for those without the dough for an XRGB Mini. Also, I'll try and respond to questions as best I can. Last edited by dooklink on Sat Jun 13, 2015 8:35 am, edited 7 times in total. Your image links give me 403 errors though. Oh no, I new that shouldn't work but did it anyway. Must be time limited. edit: Okay should be fixed now. Does that mean we will be able to flash a custom firmware into the GBS ? Sorry I didn't get much of the technical part but if this can be achieved by the average guy using a computer it is definitely great news considering the price and availability of those boards. The answer is yes, but with some work. The settings I have pretty much finished. They are not that hard to change and add to. The problem is I've tried to write to the MTV230 and ended up erasing it completely on one board. The Chinese love using Intel 8051 core CPUs as they are IP free now, and cloned and added to in silicon. The MTV230 has OSD output and measures the sync inputs for timing. But Programming for it is not as easy. Then there is the matter of flashing once a firmware is avaliable. This would require an interfacing board with USB to make it easy for most people. I was thinking something like the SLG-In-A-Box but with USB for firmware updates. Wow, that's pretty impressive. But I guess there's no way to get rid of the GBS8220's analog interference "wind" pattern? Great work! Maybe I can get some use out of my GBS-8220 and SLG3000 again. Wind pattern? I'm not sure what you mean. Do you mean the horizontal scaling artifacts? Or do you mean signal to noise ratio on single colour sections. Hrm, that sounds terrible. Is it anything like the 50Hz noise In my OP. What does it look like if you turn down all the pots to zero picture? I don't think that is normal. This signal type is quite important, is this RGB or YPbPr, 50 or 60 Hz? It's weird as I have had a few people state they can't get PAL 50hz working right on these boards. I have two and they both work fine. Would be good to have information on a working programming solution and code available. Looks like I'll have to get myself a Pi. 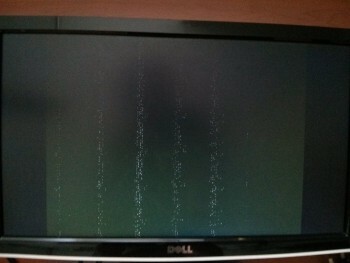 RGB (output), problem is independent of the input signal or refresh rate. It doesn't look like the "dot clouds" you have at 50Hz. Maybe I can get around to wiring it up again sometime. Yeah, I expected for it to work form your videos, big fan btw . My first two boards had the sparkles through them and my third can't do 50Hz. My third board I bought from Jammaboards.com, or thier Ebay store at least. They list it as having special firmware changed by the manufacturer to work with Midway 55Hz cabs I believe. Another awesome line doubler/upscaling project! 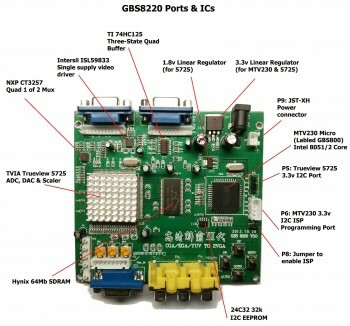 The GBS-8200 is so relatively cheap, that if it can be turned into something more useful for a few extra $, that would be awesome. I also didn't realize the TruView chip did line doubling, and not just frame buffering. By all means, keep working on this project. 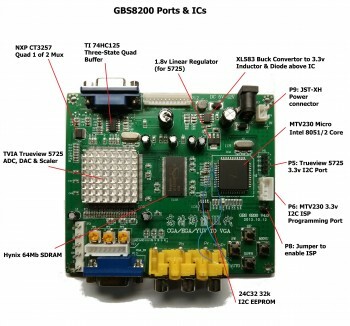 I think the community here would be very excited about a GBS-8200 soft hack with the added features you listed. Coincidentally I ordered a HD9800 V5.0 board today, so this is very interesting. I understand there isn't any real difference between the HD9800 and the GBS8200, so would you expect this to work on the HD9800 too? I'm hoping to use it mainly to play my Playstation 2 at 480i on my LCD monitor. If it ends in the sale of preflashed GBS boards (as I assume home flashing would lead to buying more hardware), I'm definitely interested. If the line doubling mode is lagless I could use it with my EDTV plasma to bypass its horrible processing of 240p content. damn, this is gooood news! +1 Keep working on it. Indeed, a Plug&Play board with modified firmware would be awesome. BTW, what was the response of Bencao74? Is he interested to include this in the SLG-in-a-box, once finished? This sounds really awesome. Even if you need to buy a pi and a GBS that is still good price wise. Most useful I think would be the pure line doubler and component out. A cheap way to hook up consoles to flat screens without compatibility issues. I have to mention that the line doubling I'm referring to still uses the deinterlacer, just without interpolation. 30hz drop shadows and the striped sprite test in the 240p test suite display correctly. But lag is still an issue. 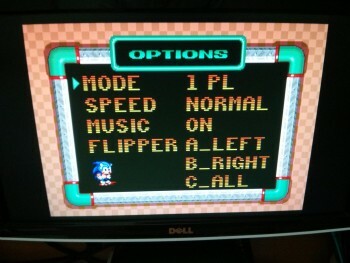 Also, I refer to this as line doubled as I can disable the vertical scaling process in the chip. So 240p/480i in, 480p out. This will be true even at higher output resolutions. Think of it as a resolution inside a resolution. Kind of like a virtual canvas that is output on the actual output resolution. Is this effectively the same as motion adaptive deinterlacing, that is used with say the HD PRO boards. Get it sorted.... I need another top gadget to review! They use the same chip, so if you enable it then yes. There are a bunch of settings for noise remove and motion adaption that I think are quite useless. Just updated the OP with links to my raspberry pi scripts. So, what are the minimum requirements? Obviously a GBS scaler and any Raspberry? Any model or does it have to be a specific model? So, what are the minimum requirements? Obviously a GBS scaler and any Raspberry? Or does it have to be a specific model? Could you also send the i2c commands with a $5 Arduino or does it need the power of a linux operating system?